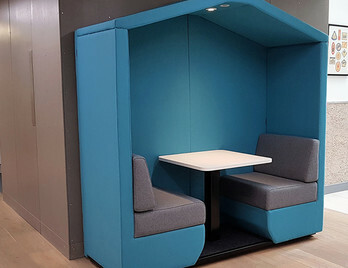 Dens are an innovative acoustic seating solution which promote collaborative work and meetings whilst also allowing you to work independently away from the workplace. Not only do Dens provide excellent sound absorption they also offer visual privacy due to the high backs and roofs incorporated in to the structure. Dens are inviting as they are often upholstered in soft to touch commercial fabrics and can feature lighting, power supply, phone chargers and LED lighting. We can help you build your perfect Den! 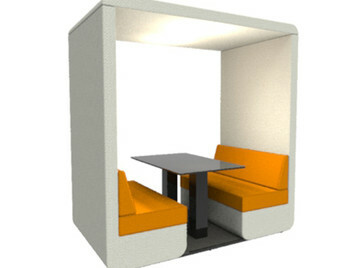 The Hive Den is great for both collaborative work and those needing a private concentration space within the workplace. 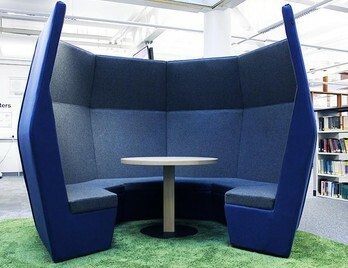 Within the Hive Den is a central table where meetings can be held or a maybe just a quick chat? Hive Dens are highly customisable with options on power, lighting, upholstery and table tops. Simple to install they are plug and play and fully (and easily) relocatable, so can be moved when you move. 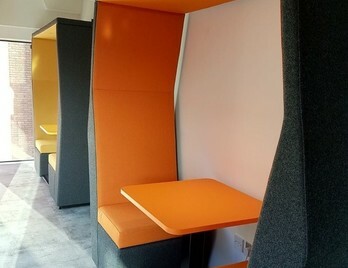 The Hive Den is great for both collaborative work and those needing a private concentration space within the workplace. A six-sided polygon build makes the Den an all-encompassing sound absorbing and containing booth. 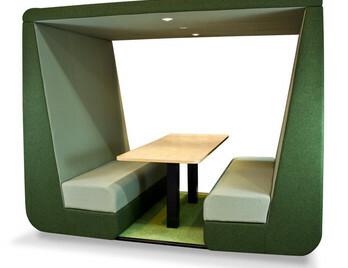 Hive Dens are highly customisable with options on power, lighting, upholstery and table tops. Simple to install they are plug and play and fully (and easily) relocatable, so can be moved when you move. The Ski Den is great for both collaborative work and those needing a private concentration space within the workplace. Within the Ski Den is a central table where meetings can be held or a maybe a coffee and quick catch up? Ski Dens are highly customisable with options on power, lighting, upholstery and table tops. Simple to install they are plug and play and fully (and easily) relocatable, so can be moved when you move. The Ski Den is great for both collaborative work and those needing a private concentration space within the workplace. Within the Ski Den is a central table where meetings can be held or a maybe a coffee or discussion? Ski Dens are highly customisable with options on power, lighting, upholstery and table tops. Simple to install they are plug and play and fully (and easily) relocatable, so can be moved when you move. 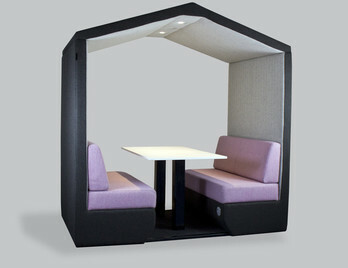 The Hut Den is great for both collaborative work and those needing a private concentration space within the workplace. Within the Ski Den is a central table where meetings can be held or a maybe a coffee and quick catch up? 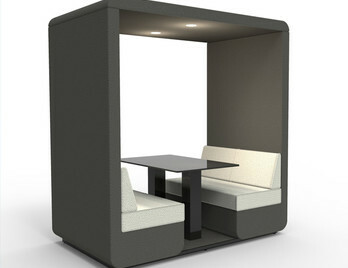 Hut Dens are highly customisable with options on power, lighting, upholstery and table tops. Simple to install they are plug and play and fully (and easily) relocatable, so can be moved when you move. 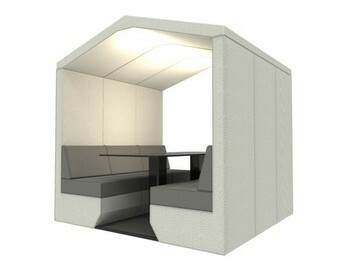 The Hut Den is great for both collaborative work and those needing a private concentration space within the workplace. Within the Ski Den is a central table where meetings can be held or a maybe a coffee or discussion? Ski Dens are highly customisable with options on power, lighting, upholstery and table tops. Simple to install they are plug and play and fully (and easily) relocatable, so can be moved when you move. The Hub Den is great for both collaborative work for up to 7 people and also for those needing a private concentration space within the workplace. 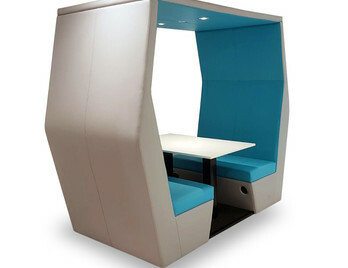 The Hub Den makes a bold statement and has been designed with large scale settings in mind such as universities, foyers, large offices and libraries. The Hub Den shares the same profile sides as The Hive Dens and look great in two-tone fabrics and are simple to install and easily relocatable. The roofed Den's often have downward LED lighting incorporated with PIR (Passive Infraed Sensor) motion sensors turning the lights on or off. Motion detectors are small electronic sensors or ‘eyes’ that detect infrared waves or heat waves that radiate from moving objects. When the detector or eye senses an object moving across its field of view, especially warmer objects such as people it electronically turns on the lights. So when nobody is using the den the light remains off saving electricity, energy and money. How long do the lights stay on for, when do they go out? The timers are set prior to installation. Once activated by human movement the lights will stay on for 30 minutes before turning off (provided there is no further movement). The sensor detects movement up to 3m away from the booth, so if the lights are on and no ones in the Den the sensor is detecting someone. If you wish this time out period to be shorter please tell us prior to installation. PIR’s are a great way to save energy when occasionally forget to turn lights off, but if they are not for you we can swap them out for a traditional light switch (not your standard plastic white one!) at no extra charge.